The 23rd April of this year is a red-letter day for the Ramakrishna Movement in South Africa when K K Pillay returned from India after embracing sannyasa. He had acquired a new ‘yoga-patta’ – a formal title – Swami Chandikananda. Sri K K Pillay is an old devotee of our Master, Mother and Swamiji. He has been associated with this organization from 1964 as a young man of 17 years when he, in due course, came under the spiritual influence of late revered Swami Shivapadanandaji, the second President of the Centre. Besides his getting diksha, he was sent to Kailash Ashram where he studied Sanskrit and some Vedanta scriptures staying as a resident there for three years. He has been Chairman of our Chatsworth Sub-centre for 8 years off and on at different times. On the last Maha Shivaratri night (27th Feb 2014) he was blessed with sannyasa initiation from Sadhana Sadan, Hardwar. This was approved by Belur Math also. It seems his Gurudev had instructed him to get into sannyasa ashrama after 65 years and hence his keen interest in embracing monastic way of life now. He was accorded a cordial welcome during our weekly Satsang on 26th April, 2014. Dan Maharaj, one of the Treasurers of our Exco garlanded him. Anand Mahabeer of the Functions Committee welcomed him and requested me to introduce the new Swami. In my intro, I traced the Vedic system of life of an individual spanning the four ashramas and sannyasa being the fourth and ultimate ashrama that enriches one’s last leg of life called a journey towards the Goal. One person getting into sannyasa ashrama would make his family’s seven generations in the past and seven generations in the future be endowed with progressive spiritual life. Wherever Chandikananda would stay and travel, he would spread the fragrance of thoughts of the principles of Vedanta as exemplified and enumerated by Master, Mother and Swamiji. His life would be an example to all those who aspire to reach the last stage of Vedic life. I then requested him to address the satsang audience. Swami Chandikananda while thanking our Centre for all the kindness extended to him, gave a short account of his recent pilgrimage to India. He explained how on the cold shivering night of Maha Shivaratri, he and sixteen other brothers from various parts of India had gathered at the bank of river Ganga in Hardwar and went through the initiation ceremony. The ceremony included an half an hour standing in the icy waters of mother Ganga while the mantras were being chanted. When the ceremony was completed he put on a warm jersey that was, he nostalgically recounted, presented to him lovingly by his Gurudev Swami Shivapadananadaji many years ago. He felt blessed when the ochre robes were presented to him by his sannyasa guru Sri Swami Vishwatmanandaji Maharaj, the Mahamadaleshwar of Sadhana Sadan, Rishikesh. In this connection he also felt elevated in spirits when he found the robes were handed over to his Guru by one of the senior monk of the Ramakrishna Mission, Kankhal who remained there for the ceremony. He expressed his gratefulness to all the monks of the Ramakrishna Mission, Kankhal who extended all help. Thereafter he enjoyed solitude at our Dehradun ashram which is situated amidst beautiful woods. He did stay in Belur Math also where he had the opportunity to meet all the senior Swamis. Most Revered Swami Smarananandaji Maharaj, the senior Vice-President of the world-wide Ramakrishna Order blessed him during his stay by giving him audience three times. He also reminisced his experience in attending a rural celebration of Master’s birthday function in Tamil Nadu when he visited our Coimbatore Educational complex centre. Swami Abhiramanandaji, the Head of the Coimbatore Mission, who endeared himself to South African devotees here during his recent visit, asked him to hand over a Cow to a poor family. In Thiruvanantapuram, he visited a few traditional temples too. In this India pilgrimage he covered other places of pilgrimage like Bhubaneshwar, Puri, Varanasi, Vrindaban, Belur Math, Chennai, Bangalore, Hyderabad also. Here is a slideshow of five pictures of Swami Chandikananda at the Ramakrishna Centre of South Africa Durban main centre during his reception on 26th April 2014. 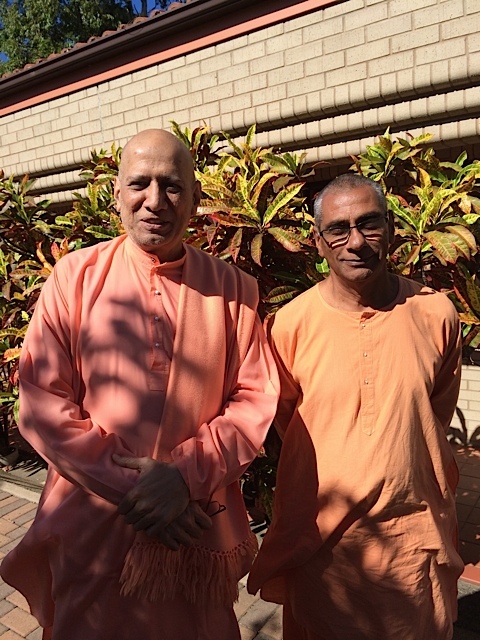 Pranam to our new Swami Chandikanandaji who will assist our Durban centre more intensively by spreading Holy Trio’s message of love and compassion! Coincidentally self also took sannyasa from Kailash ashrama on the same day 27th Feb 2014. Lord’s wish and Sri Ma has one more baby on her lap! Trust by His grace this finds you all hale and hearty. A happy Akshaya Tritiya day! Yes, indeed I heard from brother Chandikananda about your arrival in Rishikesh and have had sannyasa on Maha Shivaratri holy night. Kudos to you for taking up the bold step! He also informed me that with him at Sadhana Sadan there were 16 other candidates. In this country we do require more number of monks. If SA Hindu citizens, who are dedicated to the Holy Trio, come up in life and embrace sannyasa that would be wonderful. In that case SA, in reference to our Master’s work, would one day become self-sufficient and therefore there would be no need to “import” monks!! I heard from senior devotees mentioning to me about late Swami Shivapadanadaji‘s vision of many monks walking within the campus of the Ramakrishna Ashram in future. Who knows it may come true one day! Please accept my pranam. Many thanks for your article on Revered Swami Chandikanandaji’s ascension to Sannyasa dwelling upon various landmarks in his spiritual life. Please convey my respectful pranam to him. Your mention about the glory of Sannyasa ashrama is wonderful. A few days back only I was re-reading with gripping interest the scintillating conversation of the great Swamiji with his disciple on the ideal of Sannyasa in the book ‘Talks with Vivekananda‘. His rendering verses from Kaupinashtakam transports the listeners into waves of ecstasy! 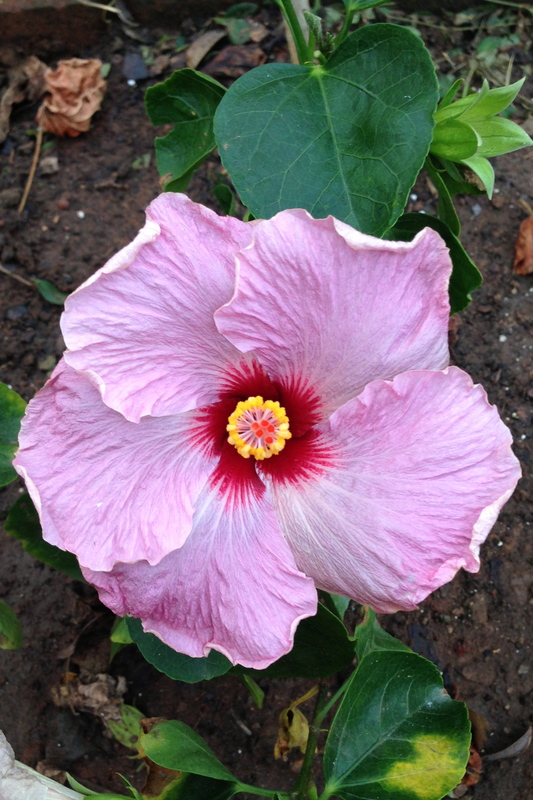 The wonderful inset in your blog of ‘hibiscus’ flower fills oneself with unearthly joy. I am reminded of Sri Raja Maharaj‘s love for trees and plants. In the book titled ‘Reminiscences of Swami Brahamananda‘ by Brahmachari Akshaya Chaitanya, a whole chapter is devoted to the above subject. He would term flower gardens as offerings to the Virat! He would strictly instruct, it seems, that only those flowers that were hidden behind the foliage should be plucked for Sri Thakur‘s worship. Many thanks once again for your wonderful blog! It enables me to be in the company of Sri Thakur and His children mentally as often as possible. Indeed a few months back I did write on Raja Maharaj‘s views on cosmic worship in my blog. Please go through it. Many thanks for providing the link for your blog on Sri Raja Maharaj‘s cosmic worship. I was very happy to go though the same and all the devotion soaked comments and your graceful replies. Today is Akshaya tritiya and tomorrow is Sankara-Ramanuja Jayanti. On this holy occasion, I seek your constant blessings. Welcome for your kind words! Here Akshaya Tritiya is simply an unknown event. I did of course tell a few devotees who came in the morning about the glory of this event. In Ranchi I had seen people would rush to bazar for purchase of even one any item of utensils on this auspicious day. Recital of Mahalakshmi ashtakam is considered good. It means there IS a way for all of us to follow the four ashramas in a formal way even in these modern times. Thank you so for sharing this. Please accept my Ram Ram to you and to Swami Chandrikanandaji. Ram Ram! Trust by His grace this finds you all hale and hearty. Yes, indeed there is a definite way! But due to lack of support, encouragement and information the system of taking sannyasa after retirement age has gone out of vogue. Hindus generally accepted the continuation of grihasta (householder) life till death because of embracing western style of livelihood. But as you know there cannot be many, many people who can opt for sannyasa. Unless one gets utter detachment and understands the purpose of life in the spiritual sense, it is futile to go for that also. I still remember Chandi-da‘s contrasting, indrawn and light-bearded face when he came along with 7-8 devotees to Joburg airport to guide Revered Sarvatmanadaji. Also in the Chatsworth center, you introduced Chandi-da to Revered Sarvatmanandaji. Indeed its a red-letter day! Revered Chandikanandaji Maharaj is an inspiration for people to lead a four-ashram life as enjoined in our scriptures. My respectful pranam to Revered Chandikanandaji Maharaj. Indeed your visit along with Revered Sarvatmanandaji Maharaj is still green in our memories. I did convey your pranam to Chandikanandaji. He was happy and conveyed his ashirwatham to you. With regards I convey my pronam and love. I have conveyed your pranam and love. I always feel elevated to read your noble writing. The feeling of ‘elevation’ happens because your mind is also in a state of same wavelength.